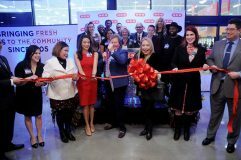 H-E-B opened its newest multi-level location in the Heights community of Houston, Texas, at 2300 N. Shepherd Drive (at 24th Street) on Jan. 30 at 6 a.m. The new 92,000-s.f. store features expansive shopping options and covered parking. It is equipped with elevators and escalators so customer can easily navigate the double-story structure. 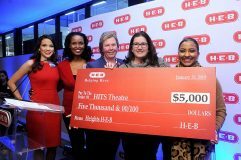 Tammy Hager, H-E-B Heights top store leader, will lead a team of more than 388 employees, many of whom were recruited from three local high schools. 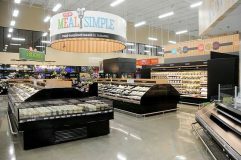 “We wanted to give students an opportunity to connect with H-E-B and grow with us,” said Hager. H-E-B chose to compliment the new shopping experience by continuing its arts initiative with a permanent installation called “Who says that chickens can’t fly, or that money can’t fall from the sky?” by Houston sculptor Elaine Bradford. The piece was inspired by H-E-B lore discovered while the artist was researching H-E-B history for ideas. 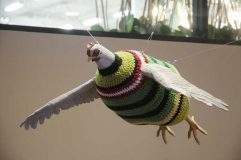 The result is a “funky flock” of chickens in colorful custom-fitted crocheted sweaters and large coins hovering above the second-story entry way (see photos below). They represent the tagged chickens given away by H-E-B during the 1930s, good for free groceries along with handfuls of nickels. The sweaters are tailored for each bird with color combinations featured in popular H-E-B products, such as That Green Sauce. This permanent installation is part of an art initiative where stores showcase local and prominent artists. 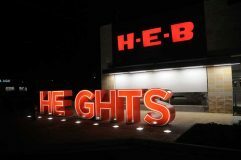 For Houston, the first of these permanent art installations was unveiled in June 2018 at H-E-B Bellaire. 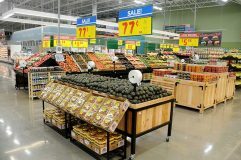 “H-E-B is always looking for innovative and convenient ways to enhance our stores with more choices. 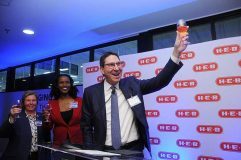 This lets customers choose how they shop, pay for and receive products, whether it’s an in-store visit, picking up an online order, home delivery or grabbing a meal on the go,” says H-E-B. 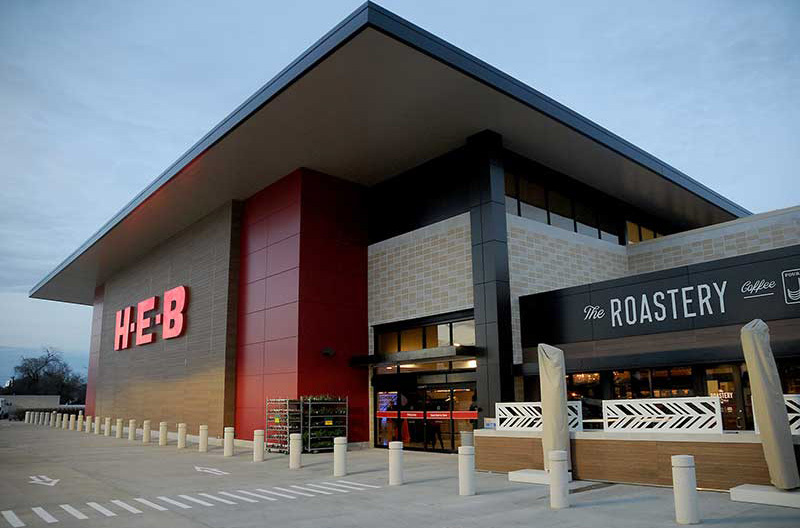 The Heights H-E-B will offer the full line of its H-E-B Meal Simple heat-and-eat options. H-E-B’s Curbside is a favorite throughout Houston and is designed to save customers time while offering all the products available in-store. 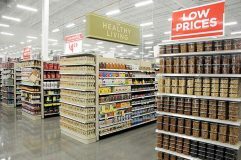 Shoppers create a grocery list, submit their order and pay at heb.com. H-E-B’s personal shoppers will hand pick all grocery selections and deliver them to customers’ cars curbside at their scheduled pick up time. 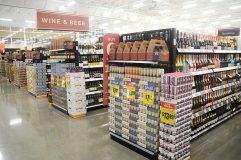 Additionally, the new store will offer H-E-B Home Delivery through Favor. 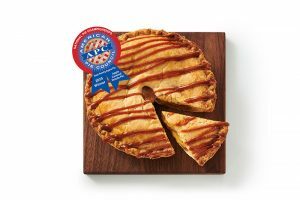 Shopper also can order and ship grocery, drugstore and general merchandise products to 48 states and military bases worldwide through heb.com. 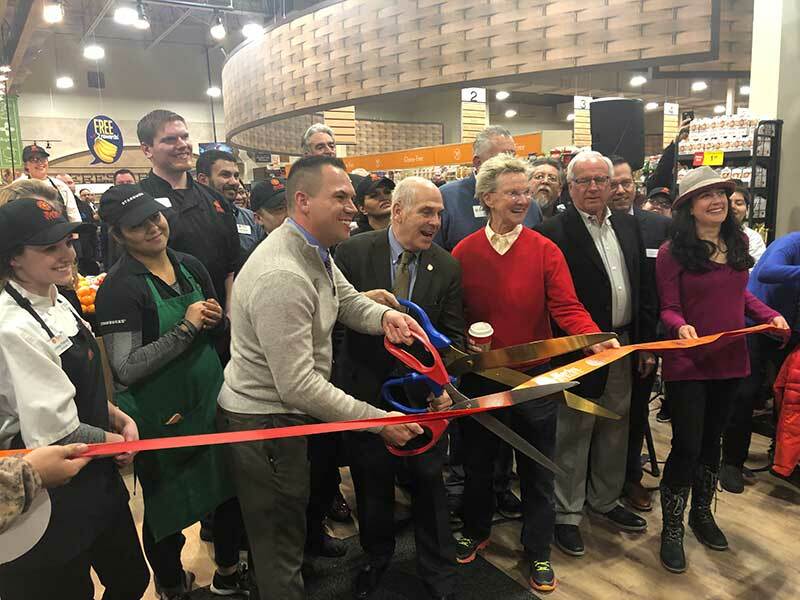 The Height’s store will also feature a Roastery Coffee Kitchen offering specialty coffee sourced from around the world, including many varieties roasted in Houston. The coffee shop and eatery will be located on the second floor of the property with a separate entrance for easy access. It will offer indoor and outdoor seating. 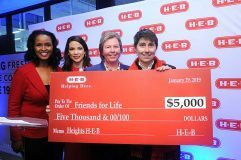 In honor of the store’s grand opening, H-E-B is making two community donations totaling $10,000. Friends for Life, the only LEED-certified, no-kill animal shelter in Houston, will receive $5,000. A second gift of $5,000 will go to HITS Theatre. Located in the Houston Heights, HITS Theatre is an educational organization offering classes in singing, dancing and acting for children in kindergarten through high school. Each production class culminates in a performance with every student participating on stage.